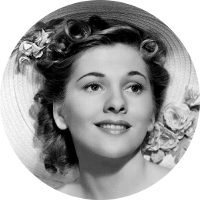 Joan Fontaine is a movie actress who was born in Japan to British parents. She won an Academy Award for Best Actress for her role in Alfred Hitchcock's Suspicion. She and her sister Olivia De Havilland are said to be the only siblings to have both won lead acting Academy Awards. Although she has starred in many memorable movies, Joan Fontaine is probably best remembered for her roles in movies directed by Alfred Hitchcock. In addition to the Academy Award she won above, she also received an Academy Award nomination for Best Actress in Alfred Hitchcock's Rebecca. Joan Fontaine is a sister to fellow Hollywood actress Olivia De Havilland. Their family tree includes a number of other famous celebrities including Elizabeth Montgomery, Richard Gere, Orson Welles, Christopher Reeve, and Linda Hamilton. Her U.S. Presidential kin include William H. Harrison, Benjamin Harrison, George Washington, Grover Cleveland, William H. Taft, Thomas Jefferson, and James Madison. U.S. First Ladies in her family tree include Eleanor Roosevelt, Mamie Eisenhower, and Abigail Adams. Joan Fontaine also has strong family connections to both the current royal family as well as a direct descent from King Edward I. The other royal connections include Queen Elizabeth II, the late Princess Diana, and the Duchess of Cambridge, Catherine Middleton. There are also connections to King Henry VIII and at least four of his wives.